5 Great Spots for Fat Biking in the U.S. The fat bike phenomenon has taken hold in the past few years, prompting seasonal cyclists to make the switch and ride year-round. Mainstream bike companies like Trek and Mongoose have taken notice and started manufacturing fat tire models of their own. Today, most bike shops carry fat bikes and the fat bike has its own internationally recognized day—December 7 is Global Fat Bike Day. Add to that the Global Fat Bike Summit and it seems these big wheel bikes are here to stay. While finding one of these bikes to buy or rent is fairly easy, finding a place to ride is a bit more difficult. To help the winter riders out, we’ve highlighted a few great spots around the U.S.
It’s tough for any state to compete with the sheer volume of trails Minnesota has dedicated to winter biking—much less the quality of the trails and careful attention to grooming. Minnesota is brimming with prime riding spots, making it tough to choose just one area, but Cuyuna Country State Recreation Area is among the best. The abandoned mining site now offers riders 20 miles of groomed trails across 800 acres—plenty of clearly marked terrain, from easy to extremely difficult. When the snow starts falling the Cuyuna Lakes Mountain Bike Crew helps groom with their own machines and provides updates on trail conditions via Twitter—The Minnesota Department of Recreation also maintains miles of tight singletrack. To rent a fat bike at a nearby shop (for $45-65), head to Cycle Path & Paddle. Breckenridge, well known for some of the best skiing in the country, is also home to some incredible fat bike trails, guides and rentals. Breck Bike Guides can rent you a fat bike for $50/ day and the guides can show you the best trails for your ability (and recent weather conditions). If you’d rather head out on your own, check out the Gold Run Nordic Center. Snowy Washington is a prime spot for those extra wide tires and Winthrop is an especially welcoming city. Each year the Northwest fat bike community meets in this very city to enjoy some of the best trails and conditions the country has to offer. For just $22 a day, head to Methow Trails and access one of the best and largest Nordic ski trail networks in the continental U.S.—18 miles are currently open to fat bike riders. For fat bike rentals, visit Methow Cycle & Sport and rent a bike for around $50 a day. For a top spot in the northeast, check out Kingdom Trails—an organization that protects and promotes the natural beauty of the region for recreational use. Set just outside of East Burke, they offer 20 miles of singletrack that’s marked by difficulty level and packed with thrills. Day passes are just $15 and you can rent equipment from either Village Sport Shop or East Burke Sports, both shops are close to Kingdom Trails. 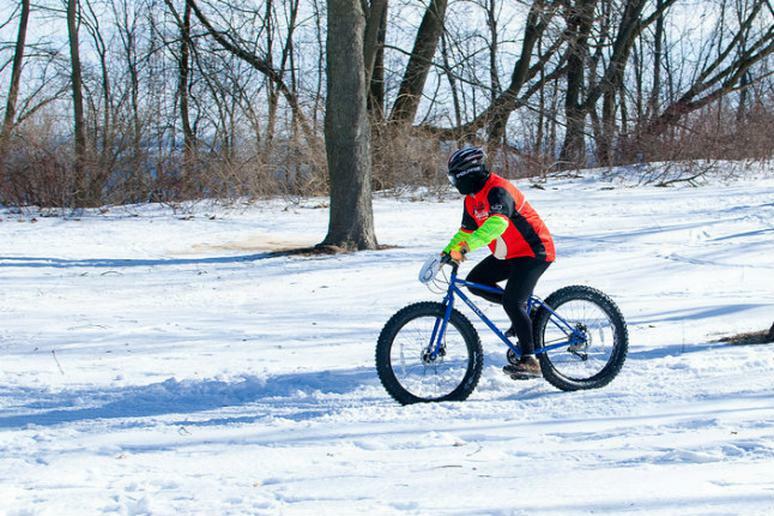 Home to Michigan's biggest Fat Bike snow race and tons of trails riders can choose from, Grand Rapids is a fat bike haven. On the off-chance the plethora of city-side trails don’t impress, head 20 minutes North of the city center to Merrell Trail, a summer favorite that’s just as much of a rush in the winter. Those seeking out rentals won’t have any problem finding a bike shop; there are tons in the area.